With any luck, her deal will close as (re)scheduled on Friday, and she'll be able to sleep this weekend. She needs it. She's been getting cranky. I just came on the blog after midnight to do a quick update while waiting on comments from a partner. Glad Husband is keeping everyone in the loop. I'm trying not to lose my mind or a positive attitude with these hours but it is difficult. Tykes seem okay so that is good. 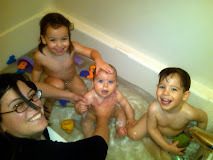 Obviously once I can breathe again I'll post about the ever elusive work-family balance/juggle. I really enjoy the Husband update, kind of like how Natalie has to inform us where she is going to be when, i like having him let me know when you are swamped with a deal! Mr. Esq- didn't you love that I knew who Frank Gilbreth was? Helen, I knew if anyone was going to recognize the reference without the link, it would be you.